Arnold Blanch, Painter of Birds, Audubon, 1944. Oil on canvas 28 by 36 inches. Arnold Blanch was a winter resident of Key West in 1916, one of the first artists to visit the island, well before it became a favorite tourist spot. He continued winter work and vacations there for more than fifty years. Blanch studied art in Europe, and served in the army during World War I. After the war he taught at the Art Students League in New York; at the School of Fine Arts, San Francisco, and at the Colorado Springs Fine Art Center. A respected artist, teacher, lecturer and art critic, Blanch worked for the WPA, Federal Art Project, as a muralist during the 1930’s. Blanch married artist Lucile Blanch, and later, one of his students, artist Doris Lee. He was Visiting Artist at Michigan State and the University of Michigan. He and Doris Lee were guest instructors at the Florida Gulf Coast Art Center, in Belleair in the 1950’s. Blanch is listed in Who Was Who in American Art. Born: Mantorville, Minnesota, June 4, 1896. Died: Woodstock, New York, 1968. Education: Minneapolis School of Art, 1921-1922; Art Students League; with Robert Henri, John Sloan, Kenneth Hayes Miller and Boardman Robinson. 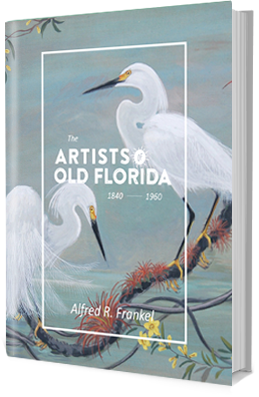 Membership: Florida Gulf Coast Art Center; Association of American Artists; American Artists Congress; American Watercolor Society; Painters, Sculptors, Gravers Society of America, president. Exhibits: Works Progress Administration, circuited exhibit, Living American Art, 1941; Florida State Fair, Tampa, 1950’s; Florida Gulf Coast Art Center, January 1951, One Man Show; Florida Gulf Coast Art Center, Belleair, art festival and open house, January 1951; Southeastern Circuit Exhibition of Contemporary American Paintings, 1951, sponsored by Florida Gulf Coast Art Center, Belleair; Florida Gulf Coast Art Center, faculty exhibit, February 1952, Morrocan Still Life; Dudensin Galleries, New York City, One Man Show; Dudensin Gallery, Chicago, Illinois; Ulrich Gallery, Minneapolis, Minnesota; Beaux Art Gallery, San Francisco, California; Rehn Galleries, New York City; Associated American Artist, New York City. WPA murals for post offices in Fredonia, New York; Norwalk, Connecticut.